The list of beneficial and informative books edited by Dr. Paul Hartog continues to grow. Hartog, a trained patristics scholar, has compiled ten chapters along with eight other New Testament and church history scholars, to examine the long-standing liberal thesis of Walter Bauer (1877-1960). The book is extremely beneficial to believers today because Bauer’s thesis, which first appeared in German in 1934 and in English in 1971, has been eagerly accepted and promoted by contemporary liberal scholars such as Bart Ehrman (12 books are referenced since 2000), and by popular writers such as Dan Brown (The Da Vinci Code). As a note, the book was dedicated to the late Rodney Decker, long-time New Testament scholar at Baptist Bible Seminary in Clarks Summit, PA, who also wrote the first chapter on the overview of Bauer’s thesis, which was completed just prior to his untimely death. The Bauer thesis (which is repeated several times in more erudite manner in the book: e.g. pages 11, 115, 183, 198, 213, 215, 223, 242) is that in the first and second centuries there were many forms of Christianity which later would be called either orthodox or heretical, and that what is today called orthodox is not the true one but rather was considered a heresy in the first century. His thesis is also that it was the Roman church [or churches] that solidified the heresy and forced it upon all other churches, eventually claiming its version to be the only orthodox Christianity. Of course, this leaves open the view that other (apocryphal and pseudepigraphal) books ought to have more authority than New Testament canonical books, and that Christianity as we know it is a hoax foisted upon the world over the last 2000 years. This view is widely accepted today by unknowing “believers,” or as Glen Thompson wrote, it has become “widespread in our post-modern and post-post-modern times” (p. 217). 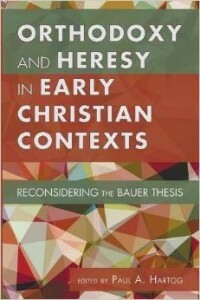 Among the many scholarly rebuttals offered by the authors of this book, Bryan Litfin writes, “That being said, the eighty years since the 1934 publication of Orthodoxy and Heresy in Earliest Christianity have not been kind to Professor Bauer. Reviewers have repeatedly suggested the author ignored evidence that ran counter to his thesis, engaged in special pleading on behalf of the ‘heretics,’ and relied far too much on arguments from silence to buttress his points. Yet beyond such methodological critiques, the very infrastructure of Bauer’s argument has been dismantled piece by piece” (p. 141-142). In the first chapter of this book alone, Decker reviewed 14 scholarly works that have disproved Bauer since he published his work in 1934. In addition, Hartog reviews at length the early rebuttal of Bauer by Walther Völker, a fellow German historian, in 1935, who wrote, “The author [Bauer] arrives at these astonishing conclusions by repeated use of the arguments from silence, by bold combinations of unrelated passages, by unprovable conjectures which themselves are reused as a precarious foundation for further conjectures, by inferences drawn from later periods, and finally by the arrangement of all isolated facts into the schema orthodoxy/heresy, whereby the variegated historical events are robbed of the full richness of their causes and motivations” (p. 236-237). The great value of a book like this is that the average reader, who does not and cannot read the ton of material related to a subject like this, can glean from those who spend countless hours reading in his place. Since this issue will continue to grow and capture the minds of an unbelieving world already bent on the destruction of Christian orthodoxy, the time spent reading the critiques and conclusions drawn in these chapters will greatly benefit anyone who is willing to do it.